Jensen Pletch is honoured and thrilled to represent DECA Ontario as Secretary for the 2018-2019 year. She is currently pursuing the French Immersion program at Centre Wellington District High School. 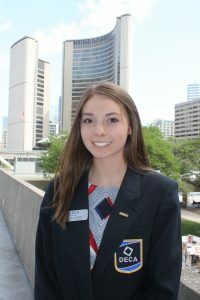 Jensen has been avidly involved with DECA in all her years at high school competing at regional, provincial and international level and recently completing a term as President for her school chapter. Outside of DECA, Jensen is apart of her school’s student council, culture awareness council and has volunteered as a Link Crew Leader assisting new students at her school for the past two years. In addition, Jensen is a certified Red Cross and Lifesaving Society Instructor and Lifeguard who works in her community to educate safety, leadership, and first aid in aquatic environments. With a passion for music and learning, Jensen completes both practical and written piano examinations with the Royal Conservatory of Music; she also plays the violin, guitar and enjoys singing. In her community, Jensen is a tutor and mentor for children of all ages and enjoys helping them succeed and strive for success in their academics. In her downtime, Jensen enjoys the outdoors, traveling, running, meeting new people, and new experiences. Jensen is ready to make this year an unforgettable experience and is excited to celebrate DECA Ontario’s 40th year by connecting with all of DECA Ontario’s members. Jensen strongly encourages anyone with questions, ideas, or recommendations to contact her through her email at jensen@deca.ca or through any of her social media.